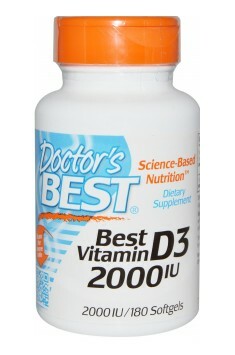 Doctor's Best Vitamin D-3 is a dietary supplement with 2000 IU (international units) of vitamin D3 in the form of cholecalciferol, which occurs naturally in animals. This is a very important nutrient, performing a variety of functions in the body, mainly in the regulation of calcium-phosphate balance and normal skeletal structure, immune mechanisms, cardiovascular system and cellular metabolism. Why do we have vitamin D deficiency? As we know, the endogenous synthesis of active forms of vitamin D3 is induced under the influence of UV radiation (mainly in the epidermis). Biosynthesis in the body is considered the main source of this essential vitamin, because few food products contain its significant amounts. When we aren't exposed enough to sunlight, the synthesis of vitamin D is not sufficient and a deficiency occur. It can happen so due to being in the geographical area with little sunlight, the presence of seasons (winter, autumn), covering and ageing of the skin. In this case, very helpful can be the supplementation. Vitamin D is now one of the objects which excites the greatest interest among researchers. Attempts are made to find its connection with the occurrence of many diseases, health problems and shorter life expectancy. Studies show that people with vitamin D deficiency may have a greater risk of developing diseases of affluence (heart diseases, diabetes, cancer, depression), autoimmune and neurodegenerative disorders. They also try to combine conditions related to low mood and impaired immunity, which increase in case of reduced exposure to sun radiation, with a shortage of vitamin D occuring during these periods. Commonly supplemented forms are D3 (cholecalciferol) and D2 (ergocalciferol). Cholecalciferol (D3) is a form naturally occurring in the human body and researches show its superiority over D2 when it comes to conversion to the active forms of the vitamin. Vitamin D is essential for the proper functioning of the body, interacts with over 200 different genes, which is important in the activation of many metabolic processes. This element is involved in the regulation of calcium balance and serves numerous vital roles in all cells. It takes part in the bone formation and growth and is crucial in functioning of the nervous system. Many scientific studies describes a positive effect of vitamin D on healthy skeletal structure, but in recent years more and more data has been focused on its hormone-like functions. It is believed that it can act as a "molecular switch", affecting the expression of many genes and stimulating the production of new proteins. Such action may contribute to a wide range of benefits resulting from appropriate vitamin D levels in the body, to which we can include: support for the immune, cardiovascular, respiratory system and skeletal muscles. It is known that vitamin D deficiency among young people, who are in the growth period of the organism, cause abnormalities in mineralization of bones resulting in a lack of peak bone mass and causing rickets. On the other hand, adults may feel bone pain and are more likely to have osteoporosis (progressive bone loss, weakened bone structure and increased susceptibility to fractures). In terms of beneficial effect on the immune system, it's alleged to have an anti-inflammatory (inhibition of cytokine production), antibacterial (activation of gene-coding proteins with antimicrobial properties) and immunomodulatory action. It's believed that there is a relationship between the amount of sunlight exposure and the increased incidence of certain types of cancer. These observations raise the hypothesis that vitamin D may also play a role in the prevention of these diseases. It has been shown that vitamin D receptors are found for instance in smooth muscles of the blood vessels and cardiomyocytes. The active metabolite of vitamin D has a direct impact on the action of platelets, sympathetic nervous system, inflammatory processes and the blood-clotting system. The indirect effect of vitamin D results from its impact on the glucose metabolism and lipid balance. Vitamin D deficiency may also indirectly affect the risk of developing high blood pressure and consequently heart failure due to the regulation of the renin-angiotensin-aldosterone system. Research findings suggest a beneficial effect of vitamin D on the cardiovascular system. It is said that vitamin D has the ability to regenerate nerve cells. Furthermore, the link has been found recently between plasma levels of vitamin D and the occurrence of sleep disorders. Its shortages may cause weakness and muscle pain and the dosage correcting those deficiences may restore muscle strength and mass among people experiencing these symptoms. Vitamin D also has an impact on the reproductive system: promotes spermatogenesis and fertility as well as inhibits proliferation of endometrium cells. It is worth noting that it has the capacity for stimulating the regeneration of liver cells. To sum up, Doctor's Best Vitamin D-3 is a product designed for all at the risk of vitamin D deficiency, which can occur because of a lack of sun or in the malabsorption of fats and fat-soluble compounds. As we know, this deficiency is one of the most common nutrient deficiencies in many geographical areas. That's why vitamin D supplementation is especially recommended in autumn-winter periods. The lowest effective daily dose of vitamin D is 1000-2000 IU, while the recommended therapeutic doses in the case of adults and elderly people are 7000-10000 IU of vitamin D per day, which is important especially in the fall-winter season, when the skin synthesis is considerably limited. Because of the fact that vitamin D is a compound soluble in fats, in order to ensure its best absorption, it should be taken with a meal containing fat. Physician-founded in 1990, Doctor’s Best is a science-based nutritional supplement company, offering more than 200 products, made primarily with branded ingredients that are thoroughly researched, manufactured to the highest quality standards, and rigorously tested every step of the way—from raw materials to finished product. We use only cGMP-certified manufacturing facilities. Doctor’s Best is committed to transparency through education and communication and strives to be crystal clear in what we offer, why and how we offer it. A strong detoxifying product, killing many pathogens, fungi and intestinal parasites. Supplement containing two forms of collagen. Supports proper functioning of the osteoarticular system.